It was great to see so many of you at our event last week at the Williams Conference Centre and great to be able to share some of the work we’re doing to expand the business. As part of 1pm plc we are committed to supporting small businesses and their funding needs and for those of you who couldn’t join us email Peri-Ann at pal@gener8finance.com for the presentation. You also missed out on winning the Gener8 Race of Champions! 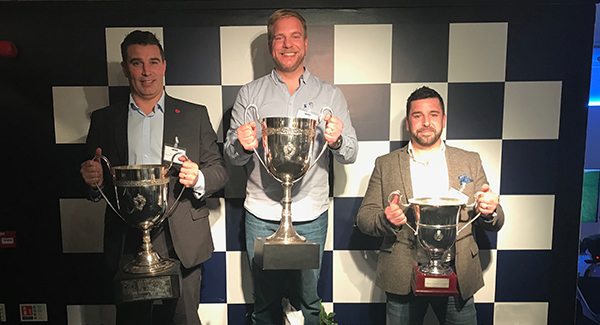 After a series of hard fought battles on the race simulator, Terry Hounsome of Primary Asset Finance was crowned as winner with Chris Hardy, RSM and Pete Hollingsworth, V4B in second and third place. Well done! “Gener8 are really good invoice finance providers because they listen and they’re flexible. No matter what we’re faced with, I know they'll be there to support us with our cash flow every step of the way." Our wider capability with 1pm plc allows us to deliver fully integrated, joined-up financial solutions across a spectrum of lending products ranging from asset finance, invoice finance and vehicle finance to commercial loans, mortgages and bridging finance. “You’ve got a great platform to penetrate the ‘S’ space in SME funding and with a range of financial instruments at your disposal, I see this as a differentiator in that market” - Chris Hardy, RSM Restructuring Advisory LLP. If you would like to talk to us about any of your client’s requirements call us on 0333 121 8888 or email Mark Riches, Head of Sales at mpr@gener8finance.com. Gener8 Finance continues to expand following the acquisition by 1pm plc in the summer. With Ed Rimmer, Chief Executive at the helm, the business is set for expansion and has access to a wider range of financial solutions including asset finance, invoice finance, vehicle finance, commercial loans, commercial mortgages and bridging finance all focused on the needs of small businesses. Ed Rimmer has worked in the invoice finance industry for over 20 years, including being UK Chief Executive for the largest independent funder. Ed commented “I know how important it is to understand and support the funding needs of small businesses. I am determined to ensure Gener8 continues to support all clients and their requirements by delivering an excellent service. We pride ourselves on our fair and flexible approach and offering a personal and accessible service by working in partnership with our customers and intermediaries”. This follows with the appointment of Tansy Battson who joins Gener8 as Head of Operations to oversee the team at Milton Park. Tansy brings a wealth of experience and knowledge having successfully managed the Bibby Financial Services Scotland business before moving south to work within their Trade and Export finance team. She will be providing valuable leadership and support to Kirsty Ibbotson (Head of Client Services) and the existing team. Tansy commented “I’m delighted to join the team at Gener8 and I’m looking forward to working with clients and introducers and supporting their funding needs. A further year of strong organic and strategic growth delivers record revenues and profits. Combined Asset and Loans Portfolio of £90m at year-end; Recommended Final Dividend1pm plc, the AIM listed independent specialist provider of finance facilities to the SME sector is pleased to announce final results for the year ended 31 May 2017. The trading results for the year reflect organic growth in revenue and profits at Onepm Finance, Academy Leasing and Bradgate Business Finance and strategic growth from the acquisitions of Intelligent Financing Limited and Bell Finance Limited towards the end of the financial year. The Group has continued to experience strong levels of demand for finance from the SME sector across the growing range of products offered. This product range now includes Asset Finance (finance leasing and hire purchase for ‘hard’ and ‘soft’ assets and vehicles), Loans, and subsequent to the year-end, Commercial Finance (invoice discounting and factoring). · Revenue for the year of £16.9m (2016: £12.5m), an increase of 35%. · Profit before tax and exceptional items for the year of £4.3m (2016: £3.7m), up 17%. · Basic earnings per share of 6.09 pence (2016: 5.87 pence), up 4%. Dividend proposed of 0.5 pence per share on approximately 83.8m shares currently in issue (2016: 0.5 pence per share on approximately 52.5m shares in issue). · Consolidated net assets at 31 May 2017 of £28.5m (2016: £23.9m), an increase of 19%. The Group’s combined gross lending portfolio amounted to £89.5m at 31 May 2017 (2016: £67.7m), an increase of 32%. Included in the value of this gross portfolio is unearned income, i.e. future revenue, of £18.9m (2016: £14.6m), an increase of 29%. Portfolio write-offs, net of recoveries of previously written off receivables, amounted to £0.9m, representing approximately 1.0% of the portfolio (2016: £0.5m, representing 0.8% of the portfolio). loan agreements (2016: £49.7m), an increase of 67%. · Combined new business origination on a like-for-like basis increased 23%. · Finance provided or lending arranged for over 16,150 customers and end-users. · Funding facilities available of £74.5m of which £49.0m utilised as at 31 May 2017 (2016: £61.5m of which £38.8m utilised). · Blended cost of borrowings fell to approximately 5.3% (2016: 5.8%). In addition, integration and cross-selling progress at each entity within the Group following their respective acquisitions is in line with operational expectations and objectives set by management. “Each of 1pm’s trading subsidiaries has continued to experience robust levels of demand for finance from across the UK SME sector. This has enabled the Group to deliver another year of operational and strategic progress and strong underlying results. The range of products now offered, plus the flexibility to fund and broke-on, mean that the Group is well positioned to build value for shareholders”. Gener8 Finance is delighted to announce that it has today, agreed terms, to sell its invoice finance business to 1pm Plc, a stock market listed provider of asset based lending facilities to the UK SME sector. This is an exciting development that should see Gener8 grow significantly from here, with the backing of a much larger group, with access to other products for its expanding client base that includes business loans and asset finance. The board of Gener8 Finance Ltd are delighted to to announce that the business is to be acquired by 1pm plc, a Bath-based specialist independent provider of finance facilities to the SME sector which is listed on the London Stock Exchange. 1pm is well-established and well-respected within the asset finance industry, providing asset finance, business loans and related financial products for both hard and soft assets and has a customer base throughout the UK, with offices in Bath, Warrington, Lutterworth and Cardiff. Completion of the acquisition is expected in early June. The Change of ownership will have no impact on the day-to-day running of the business and it will be very much “business as usual”. However being part of a much larger Group, Gener8 will be able to offer a broader range of products to clients as well as access to further funding. Going forward, the Gener8 business will form an integral part of a new Commercial Finance division within 1pm which will be headed by Edward Rimmer. Ed has worked within commercial finance for over 20 years having joined Bibby Financial Services Group in 1995. He spent 5 years as UK CEO and main board director of Bibby Financial Services Limited, achieving significant success including doubling of profits between 2007 and 2011. Ed has known David Richards for over 20 years and has worked directly with David over the past 3 months in order to satisfactorily conclude the deal. Continuity of management and client relationships will be key elements in ensuring the successful hand-over of the business and in preserving Gener8’s reputation for outstanding quality of client and introducer service and colleague relations. Ed will also be joining the main PLC Board of 1pm. Following completion, David Richards will remain with Gener8 as a consultant for a six month period working with Ed Rimmer to ensure a smooth and orderly transition and integration within 1pm. It's been another very busy year at Gener8 and we’d like to thank each and every one of you for working with us during 2016. Just like you, we’re ready for a well-deserved break over the festive period, so please find our Christmas and New Year's opening times below. For seamless payments over this period, we advise that you make your payment requests via your online link or by CC-ing: team@gener8finance.com in each request. That way, even if your usual contact is on holiday, your payments will be processed promptly. Here’s to helping your business grow and prosper through 2017 and beyond. There are ways to fund your business growth plans other than bank loans. Paul Stokes, Gener8 Finance talks about Invoice Finance with The Business Income Generator. I hope you are well. I wanted to drop you a note to thank you. I've become cynical of invoice financing businesses over the years, having been let down many times. Today, you delivered exactly the flexibility that you promised in our meeting. It has meant improved cash flow for our business and Kirsty was exceptional today. Her understanding of our business and particularly her clarity in communication was tremendous. Thank you. We are delighted to be onboard with Gener8! Gener8 Finance are proud to sponsor The Panathlon Challenge and enjoyed a great day at the Olympic park finals last week in the Copper Box. The Panathlon Challenge provides sporting opportunities to over 7,500 disabled young people every year. Since 1999, we have run over 500 ‘mini Paralympic’ multi-sport competitions for secondary or primary school children, along with dedicated football, boccia and swimming programmes. Panathlon has also trained over 3,000 young leaders, aged 14-19, who act as sports officials for Panathlon competitions. Gener8 Finance breaks the £1 billion 'pound' barrier! After just over 7 years Gener8 Finance has just purchased its £1 billion invoice from a growing SME client portfolio. Paul Stokes, Gener8 Managing Director comments: "Breaking the £1 billion barrier in such a short period of time is a fantastic achievement for all concerned with Gener8. Thank you especially to our staff, clients and business introducers for helping us get here. Here's to the next billion!" Harpur Recruitment based in Milton Keynes uploaded the invoice to reach the milestone. Gener8 has been providing flexible working capital funding to John Day, who owns Harpur, for more than 5 years and this has allowed him to expand the business significantly. To celebrate the achievement Gener8 and Harpur Recruitment will be donating to two of their chosen charities. John Day has chosen 'The Willen Hospice' in Milton Keynes who provide end of life specialist care. Gener8 has made a donation to one of its favourite charities. The Panathlon Foundation, a national charity which has been providing athletic and sporting opportunities to less able children around the country for over 20 years. Gener8 officially reaches its 8th birthday in June this year and to celebrate we are holding a prize draw, exclusively for our clients, as well as offering enhanced incentives for introducing new clients to us. The prize - a trip to New York for 2 people, flying Virgin Atlantic, with 3 nights accommodation at a 5 star hotel in the centre of Manhattan. As a valued Gener8 client, your name is already in the hat for the draw which takes place on 30th June 2016! you can have, the more introductions you make, the greater your chance of winning. result in a significant saving for your business for years to come. 1. The prize draw is only open to clients of Gener8 Finance Limited (Gener8). 2. The prize draw is free to enter and no purchase is necessary. You are automatically entered into the prize draw by virtue of being a client of Gener8. 3. Only one entry per client is permitted though each client will be entitled to one further entry per lead introduced by that client to Gener8 in the qualifying period only. 4. The closing date of the prize draw is 5pm on 30 June 2016. The winner will be chosen by random draw after 5pm on 30 June 2016. 5. The winner will receive a trip to New York for 2 people, departing from London Heathrow, flying Virgin Atlantic, with 3 night’s accommodation at a 5 star hotel in the centre of Manhattan. Both the flight times and hotel accommodation are subject to availability at the time of booking, and may not be taken on days which fall on public holidays in the United States. The prize does not include travel insurance, the cost of transfers to and from airports or stations, food and drink, spending money, tax or personal expenses. Any other costs and expenses incurred in addition to those set out above and that are incidental to the fulfilment of the prize are the responsibility of the winner. 6. The winner will be notified by email or telephone (using details already held by Gener8) on Friday 1 July. If a winner does not respond to Gener8 within five days of being notified by the Gener8, then the winner's prize will be forfeited and Gener8 will be entitled to select another winner in accordance with the process described above. 7. The prize must be booked as soon as possible after notification of winning and in any event by 30 July 2016. The prize must be taken before 31 December 2016. 8. The prize for the winner is non-exchangeable, non-transferable and no cash alternative is offered. 9. Gener8 reserves the right to replace the prize with an alternative prize of equal or higher value if circumstances beyond Gener8’s control make it necessary to do so. 10. The decision of the Gener8 regarding any aspect of the prize draw is final and binding and no correspondence will be entered into about it. 11. The winner's name can be obtained by sending an email to team@gener8finance.com on or after Monday 4 July 2016. 12. Participants are deemed to have accepted and agreed to be bound by these terms and conditions upon entry. Gener8 reserves the right to refuse entry, or refuse to award the prize to anyone in breach of these terms and conditions. 13. Gener8 reserves the right to hold void, cancel, suspend, or amend the promotion where it becomes necessary to do so. 14. Insofar as is permitted by law, Gener8, its agents or distributors will not in any circumstances be responsible or liable to compensate the winner or accept any liability for any loss, damage, personal injury or death occurring as a result of taking up the prize except where it is caused by the negligence of Gener8, its agents or distributors or that of their employees. Your statutory rights are not affected. 15. Winners may be required to participate in publicity related to the prize draw which may include the publication of their name and photograph in any media. 16. Personal data used or supplied during the course of this promotion may be passed on to third party suppliers only insofar as required for fulfilment/delivery/arrangement of the prize. 18. Gener8 Finance Limited is a company registered in England No 5593395 whose registered address is 68G Innovation Drive, Milton Park, Abingdon, Oxfordshire, OX14 4RX. Funding to UK and Irish businesses secured against invoices and other assets has hit a record high of £20 billion says the Asset Based Finance Association (ABFA), the body representing the asset based finance industry in the UK and the Republic of Ireland. The ABFA says this is the first time the use of asset based finance has reached £20 billion and is an increase of 4% from the £19.3 billion businesses in the UK and the Republic of Ireland were accessing against assets a year ago. The ABFA says the growing popularity of asset based finance stems from its accessibility to the vast majority of UK and Irish businesses who have assets such as unpaid invoices against which they can borrow. Finance based on a business’ existing assets frees up cash flow for investment or working capital; these types of finance are increasingly important with ongoing restrictions on lending through ‘traditional’ products. Award winning Gener8 Finance provides confidential and disclosed invoice finance facilities to UK SMEs across the country ranging from new start and up to £10m turnover. *Sources: Q2 2015, Business Finance Taskforce data. Paul Stokes, Managing Director commented "This award recognises the commitment and attention that we believe we deliver to our clients day in, day out. I am really proud of the whole Gener8 team for making us stand out against some serious contenders". At Gener8 we know that even strong, established businesses can sometimes experience cash flow problems. We have the knowledge, experience and desire to help owner managers, operating in a wide range of sectors, to grow their businesses. And, as this award evidences, we are not just there for the good times. If you would like to discuss your invoice finance requirements, or if you know a business owner who would benefit from our award winning service, please contact us by calling the office on 0333 121 8888 or via the website link below and a member of the team will be delighted to help. Wallingford RFC under 11s first ever tour last weekend to Exeter was a great success and enjoyed by all. The team travelled to Exeter on Saturday for a training session at Sandy Park, followed by a tour of the Exeter Chiefs stadium, meeting the team and then watching the final match of the season v Sale Sharks, with Exeter winning 44-16. Then on Sunday the team were invited to Withycombe RFC to train and play against their under 11's - which was enjoyed by all. The tour was a great success and are now looking forward to planning their next one. Gener8 Finance is delighted to announce it has become a full council member of the asset based finance association and industry advisory body, known as ABFA. It is another stage in the growth of Gener8 from a small independent invoice finance house, established in 2008, to a countrywide supplier of cash flow funding solutions to UK SMEs, specifically targeting confidential receivables finance services. David Richards, G8 CEO, commented "We are delighted to be a part of ABFA, whose methodologies we have always followed for the benefit of our clients, their customers and our business partners. As we reach stage 2 of our growth plan we partner with our Industry Association, at a time when Jeff Longhurst, as CEO of ABFA, and his team, are forging ahead for the benefit of us all." Gener8 goes on a recruitment drive! 1) confidential facility for £1.5m turnover, London based, interim and permanent financial personnel provider. 2) disclosed facility for £3.6m turnover, Northants based, logistics personnel provider. 3) confidential facility for £700,000 turnover, new start, South Coast based, electrical engineering personnel provider. 4) disclosed facility for £750,000 turnover, Kent based, facilities management personnel provider. 5) confidential facility for £1m turnover, new start, London based, construction personnel provider. 6) disclosed facility for £500,000 turnover, Suffolk based, driver hire personnel provider. Businesses in the UK received an all-time high £19.4bn of funding through asset-based finance in Q4 2014, an increase of £1.6bn on the same period a year ago, said the Asset Based Finance Association (ABFA), the body representing the asset-based finance industry in the UK and the Republic of Ireland. The ABFA said that this jump in the use of invoice finance and asset-based lending (borrowing against the value of the businesses other assets) is now primarily driven by businesses funding growth plans rather than replacing their use of traditional term loans or overdrafts. According to the research, businesses are now using 38% more asset-based finance than at the height of the recession in December 2009, when £14.1bn was provided. The ABFA said that the speed at which asset-based finance facilities can be agreed or extended makes them an ideal way for businesses to respond quickly to growth opportunities arise as the economy recovers. Jeff Longhurst, chief executive of the ABFA explains that there is also another £20.5bn of unused facilities agreed with businesses which they could drawdown if they required it. Increasing numbers of businesses view asset-based finance as an ideal option for getting their investment plans off the ground quickly, as providers offer expertise across a wide range of sectors so the lending process can be smoother and quicker than seeking traditional funding products. As funders can use the businesses the invoices or other assets as security they are able to make swift lending decisions. Jeff said: “For a business looking to capitalise on a growth opportunity being able to raise rapidly and deploy funds can give you a vital edge over your competitor. “Having in place the finance that allows you to move faster than your competitor allows you to fill orders quicker, make quicker hiring decisions, secure those new premises and take market share quicker. 80% of asset-based finance is invoice finance, in which businesses secure funding against their unpaid invoices, while the other 20% represents the fast-growing area of asset-based lending, in which businesses can raise money secured against a range of other assets they own, including inventory, property and machinery. Gener8 Finance has become the new sponsor of fundraising website Make a Donation, joining its vision to change the future of giving. The sponsorship will help to ensure that fee-free fundraising continues for all charities on the site. make-a-donation.org is a unique fundraising website where 100% of donations go to the charity and no fees are charged, even bank transaction fees. This is all thanks to the help of the business community and sponsors. This sponsorship also heralds the start of the business community acting with greater social responsibility, marking their desire to support the third sector in a more effective way. Another very busy year is nearly over and we’d like to thank each and every one of you for working with us during 2014. Just like you, we’re ready for a well-deserved break over the festive period and you’ll find our Christmas and New Year opening times below. For seamless payments over this period, we advise that you make your payment requests via your online link or by CC-ingteam@gener8finance.com in each request. That way, even if your usual contact is on holiday, your payments will be processed promptly. Here’s to helping your business grow and prosper through 2015 and beyond. Fri 2nd Jan - 8.30am - 1pm. Deploy UK and Deploy Rail were both new start ventures when they approached Gener8 for cash flow finance back in 2009. In a sector that can be extremely tough they have both thrived and turnover is now over £10m and still growing rapidly. The DE Group's total turnover is now north of £20m and with combined funding facilities needed of over £2 million it is time for us to uncouple..
their goals andwe wish them every success for the future. ...Nor did we until we provided a stock and invoice finance facility to a long established European wide distributor of speciality fireworks based in South West England. Having been let down at the 11th hour by their planned stock finance provider, Gener8 stepped in to help pay suppliers to enable the timely delivery of products to all customers ready for November 5th. A £350,000 facility was structured to enable the seasonal peak trading up to Xmas, but also accommodate the quieter months when trade is minimal and therefore keeping overheads low was paramount. Gener8 is fast approaching three quarters of a billion (yes billion!) of invoices financed for its growing SME client base. With £50 million financed, just in the last quarter, Gener8 expects to reach the £1 billion mark inside the next 18 months and this will result in a special prize, for the client who uploads the "Golden Invoice" that marks £1 billion turnover and for the introducer who referred the client to Gener8 in the first place. Why not try us out today and your name will be automatically entered into the hat for the "Golden Invoice" prize! P.S. We accept fully this is not a particularly new or unique idea and may have been tried before somewhere...bear with us! More details to follow regarding the "Golden Invoice" prize. Trust us with your cash flow? "There is no doubt that without the support of Gener8, we would not be here and still trading. If only more companies were more supportive of small businesses, less of them would go out of business every year destroying people’s lives and livelihood's. We have been with our well known high street bank since we first set up the Company in 2008 and we have never had support from them throughout those years. As we were over our overdraft limit this week, they put a freeze on our commercial cards so we had no access to cash and no access to the cards to buy materials – they could not be more unhelpful. For the relationship to work, it cannot be anything less than honest, open and transparent, we have nothing to hide and the situation we were in was plain for all to see. We could not have got through it on our own and we would not be here today without your support (and everyone is so nice to deal with which just makes it even easier!)." You are only one click away from securing tailored cash flow funding. Gener8 Finance has recently provided a £250,000 confidential invoice discounting facility to a print management business based in Kent. Funding was approved to assist with the management buy out from a long established marketing services group. Effectively a new start, but with forecast annual turnover approaching £4m, Gener8 worked with the Company's Accountants and Owner to secure an appropriate solution quickly, to replace the previous bank borrowing and thus secure the cash flow needed to support this new, fast growing venture. Contact on of the sales team and we will be delighted to discuss any potential working capital needs for you or your clients. Gener8 Finance provides cash flow funding solutions to UK SMEs, ranging in size from new start and up to £10 million turnover. With daily access to decision makers and a specialism in providing confidential invoice finance to smaller companies, Gener8 has built a portfolio of clients who are in control, but require flexible working capital solutions to suit their rapidly changing and growing businesses. Record year for asset-based finance as businesses step up borrowing against invoices to fund growth. The supply of asset-based finance to UK businesses has hit a record high in the last 12 months with an average of £17.5bn in use at any one time by businesses over the last year, says the Asset Based Finance Association (ABFA). This is 9.4% up on last year’s average and up 29% from the £13.6bn of asset-based finance in use at the height of the recession in 2009/10. In contrast, the average value of traditional forms of funding supplied to businesses fell by 5% over the same period. Net traditional funding to businesses is now down by almost £100bn since 2009/10, falling 19% from £485bn to £391bn. The ABFA explains that 80% of asset-based finance is invoice finance, in which businesses secure funding against their unpaid invoices, while the other 20% represents the fast-growing area of asset based-lending, in which businesses can raise money secured against a range of other assets they own, including stock, property and machinery. The ABFA says that these figures show that invoice finance is now a mainstream funding product for businesses, playing a major role in filling the SME lending gap created as banks remain restricted in the levels of finance they can provide to businesses. Martin Morrin, chairman of the ABFA, said: “Invoice finance is playing a bigger role than ever in funding British businesses’ growth, and has truly stepped into the mainstream of business funding. “Since the credit crunch, invoice finance has become an even more important source for SMEs for funding as they struggled to access traditional term loans. Now, as the economy recovers, more and more businesses are using it to fund their growth, and that’s pushed demand for funding to levels we haven’t seen before. The Government and the business community have been looking for a new mainstream financial product with the potential to fill the gap created by the continued lack of term lending. These figures show that asset-based finance, and invoice finance in particular, is that product.” ABFA says that many businesses do not realise that the invoices that they have outstanding with customers are often the most valuable asset owned by the business,and that banks and other funders will willingly lend against them. Generally speaking, loans that are not secured against assets have become harder to find over the last five years. Gener8 Finance has recently supported the refinancing of one of the UK's longest established bespoke postcard and calendar manufacturers based in the South of England. With turnover increasing beyond £3m, Gener8 has provided the business with a £500,000 Confidential Invoice Discounting facility, to support the continued growth, after their Bank proved too difficult to work with. Wish you were with us? Contact one of the team today and we will be delighted to see if we can help. We are delighted to announce that Jeff Longhurst, Director of Client Services at Gener8, has been appointed as Chief Executive Officer of the Asset Based Finance Association, the Industry's trade and regulatory body. Jeff will step back from his day to day duties at Gener8, but will remain on the board for the foreseeable future. Managing Director of Gener8, David Richards commented "This is the perfect role for Jeff, who has a long history with our Industry Association and many many years experience in running Asset Based Lending ventures. Whilst we will be sad to lose him on a day to day basis, it is a role we could not stand in the way of and we wish him all the best." Jeff Longhurst added "I am delighted to be taking up my new role at a time when Invoice Finance is rapidly becoming the first choice for working capital for SMEs. And although I shall miss the day to day involvement with Gener8 I am pleased that my involvement with such a service focussed business will not completely cease". I'm delighted at the appointment of Jeff Longhurst to the position of ABFA CEO. Jeff has a huge amount of industry experience at both independent level and at bank level. ABFA is going through a phase of development and reassessment, and Jeff is someone who is ideally suited to help take the industry forward, through what may well turn out to be an important transitional period. A long established, London wine distributor, with turnover expanding beyond £8 million, has secured a confidential invoice discounting facility from Gener8, inside 4 weeks, from first enquiry. Having approached their bank, they were told their financial software wasn't compatible so would need to be changed to secure a facility, to enable the buyout of one of the original founding partners. Gener8, in line with its usual approach, adapted a working capital facility to suit the client, to accommodate the existing software and the client was able to draw down in time to complete the transaction. New SME funding site arrives as OFT warns banks. Key providers of alternative finance in the UK have teamed up, and announced the launch of a new platform for smaller and medium-sized businesses, with the aim of providing further funding solutions beyond the banking market. The country’s seven leading investment alternatives, including invoice financiers Market Invoice and Platform Black, have joined forces to create www.alternativebusinessfunding.co.uk a portal designed to market smaller-sized enterprises to potential finance sources, and to educate business owners on the number of funding avenues open to them. Only one in 11 businesses has used invoice financing in the past 12 months, and even fewer have used asset based lending, the new research says. British SMEs own GBP770bn in assets, the equivalent of almost half of the UK's GDP, that could be used to fund growth, new Lloyds Banking Group research claimed. According to the report, although 52 per cent of SMEs are more confident about investing in growth, they are still missing out on the opportunity to recruit new staff, develop new products or break into new markets. While almost half (49 per cent) are aware of invoice financing, and around a third (36 per cent) are aware of asset-based lending, only one in 11 businesses has used invoice financing in the past 12 months, and even fewer (five per cent) have used asset based lending. In contrast, far more businesses have used an overdraft in the past year (24 per cent), while almost one in three have used a loan. Donald Kerr, managing director of Lloyds Bank Commercial Finance, said: "If they had access to the funds, more than a third of businesses (38 per cent) want to take on new staff, almost as many (31 per cent) to break into new markets, while more than a quarter (27 per cent) would look to develop new products. "This is positive news and suggests that businesses recognise the opportunities that are out there for them in the recovery. "But despite the fact that even the average SME is owed almost GBP60,000 in unpaid invoices - and that for one in nine (11 per cent), those outstanding bills are worth more than GBP200,000 - even those businesses who are aware of different finance options appear not to understand them enough to take advantage of them. "Unless businesses start looking at potential solutions like these more seriously, both they and the UK's recovery overall are likely to be held back." In an interview with Lexology.com, David Crumbaugh of international business law firm Latham & Watkins has attempted to explain the continued growth of the asset-based finance industry in recent years. Latham & Watkins is a business law firm specialising in complex business transactions, litigation and corporate finance, so has considerable experience when it comes to matters pertaining to SME finance. ‘I would say that ABL loans have gone mainstream in the last four or five years and as people find more uses for them they are going to continue to increase in popularity,’ says Crumbaugh. Asset-based lending facilities such as invoice finance are already increasing in popularity, and with good reason. Within the small business finance world, new pieces of legislation can often have a dramatic effect on the choices businesses make to ease their cash flow strains. After announcing a crackdown on payday loan advertisements months ago, the Financial Conduct Authority (FCA) has now declared that they will introduce even tougher regulations to protect consumers. We have previously mentioned the dangerous disadvantages of using payday lenders to help dig yourself out of financial difficulty, and it would seem that the FCA are equally as concerned. They have proposed that all borrowers should have an â€˜affordabilityâ€™ check before being given a loan. This means that anyone wishing to borrow money from a payday lender will have to prove that they will be able to afford to repay it. It seems unusual that this check was not already in place, particularly given the success of the invoice finance model. As the capital we lend is dependent on what is owed to companies, they will rarely find that their debts outweigh what they can afford to pay back. However, when those who have borrowed from a payday loan in the past were recently surveyed, one in five said they were not even asked about their finances, let alone how they would be able to repay it when they applied for their loan. Such practices of lending and borrowing without qualification are typically found difficult for both parties. A second rule that the FCA intends to put into place is for risk warnings to be included with all adverts and marketing material. They have stated that they do not want these warnings to put consumers off using payday lenders, but simply be more informed if they do. The FCA worries that if they ban payday lenders altogether, people will be increasingly likely to turn to illegal loan sharks instead. Of course, for those with financial struggles that are directly affecting their business, an alternative lender such as Gener8 Finance could be far safer and reliable, as it only allows you to borrow what you will eventually earn. In addition, payday lenders will soon have to offer free debt advice to anyone extending their loan, as well as limiting the number of attempts they make to take money out of a borrower’s account to two. They will also not be able to extend or roll over loans more than twice. While these changes may be coming into place a little too late for some, they will hopefully encourage future borrowers to be cautious when approaching such lenders or seek more supportive help elsewhere. Why is invoice financing such a growth industry? The use of asset-based finance facilities, such as invoice financing, has increased dramatically of late. In 2012, 4% more UK businesses made use of asset-based finance facilities than in 2011, while the US has experienced 15% growth over a seven year period. So why is it that invoice factoring, a relatively marginal form of business finance, has suddenly become so widespread and popular? What is the reason for this current trend? We've taken a look at some of the key factors below. Up until a few decades ago, invoice financing was seen as a marginal form of financial assistance, and in some instances had something of a negative reputation on its shoulders. Disreputable firms were accused of profiting from business failure, while business customers were concerned that a heavy-handed approach to debt collection could damage their relationships with their clients. In recent years, however, invoice finance has become increasingly legitimised, as more professional, reliable firms began to offer invoice finance as a service. Today, many businesses realise that they no longer need to worry about the quality of service they’re likely to receive from an asset-based finance provider. While the asset-based finance industry has gained credibility of late, quite the opposite process has befallen the traditional banking sector. Businesses are beginning to realise that the banks are not as reliable or dependable as they would have us believe, while a sense of resentment remains amongst businesses and private citizens alike following the bank bailout of 2008. As customers have lost faith in the services offered by the banks, alternative finance providers have become increasingly popular. It is well publicised that business lending has fallen dramatically over the past few years. The country’s SMEs are finding it increasingly difficult to secure the loans they need for growth, and with traditional lenders unable or unwilling to help, more and more UK businesses are beginning to look elsewhere. More often than not, invoice finance providers will offer help and support for the country’s growing businesses where the banks will not. Ultimately, however, invoice financing has not been growing simply because of the trials and tribulations experienced by the traditional lenders. The reason why more and more companies are beginning to rely on invoice financing is that the service provides them with the support they need under satisfying terms. Customers are realising that they can harness capital quickly and easily with the help of invoice finance, and furthermore, that they needn’t experience the high interest rates associated with business loans, either. There is a reason why invoice finance services have become so popular of late. A recent report by Albion Ventures has revealed that 40% of the 450 small UK businesses surveyed have had financial applications rejected by banks. Out of the 450, only 17% of firms actually applied for finance in the past 12 months, for fear of being rejected, or the belief that approaching banks could pose a threat to their business. Many SMEs are concerned about how a lack of access to finance will impact their businesses growth, as 32% of those who were looking for financial help from the banks were doing so simply to keep their business going. Interestingly, the report highlighted a significant difference in attitude and direction toward raising finance between companies who have an optimistic and pessimistic outlook on their future. The optimists, who were positive that they would be able to grow their business someday, opted for invoice discounting, believing that would help them progress. At Gener8 Finance, we offer invoice finance and discounting services that we tailor to each individual or organisation, to ensure that you don’t end up in further financial difficulty. While banks might decide to reject you before learning anything about your company, we take the time to get to know all the ins and outs so we can be sure to offer you the best possible cash flow facility. If you would like to find out how Gener8 Finance can help your business start looking forward to a successful future, get in contact with a member of the team today. Speak to one of our team today and find out how we can help you.